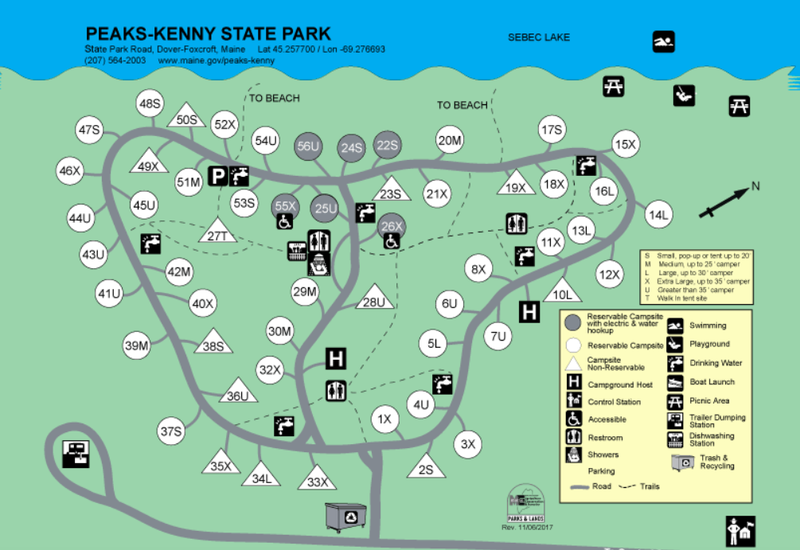 RESERVE A PEAKS-KENNY CAMPSITE AT THE MAINE DEPARTMENT OF CONSERVATION WEBSITE STARTING TUESDAY, FEBRUARY 5th at 9:00 AM. each party may reserve up to two campsites online. When making your reservation, have on hand your credit card, length of camper/RV if applicable, number of people in your party, and the dates you wish to reserve. If you have questions, please see Erin or David Bridges (207.876.4294 or davidb@ccmainehighlands.org). Remember to check the reservation list to see which sites are being reserved by others and to indicate which site you hope to reserve. We usually aim to reserve the sites on the right side of the map below (roughly Sites 1-33). Let everyone know on this shared document when you have successfully reserved your site.